This is the first of a three part series that Mr. Anderson explores the notion of patent trolls and how we find ourselves here as an industry and what we do to move, productively, beyond the rhetoric that holds us back. There is no use doubting that the fabled “patent troll” narrative dominates contemporary discussion of patents. I won’t even bother to link to the myriad of articles and blogs, both in the so-called ‘blawg’ sector and in mainstream media, that refer to these mythical creatures as solid fact. If you pay attention to the space, you’re already aware. If you have no idea, just run a google-news search for ‘patent troll’ and you’ll be inundated. But the more important question is not whether the narrative exists, but rather why. Before getting into that, a bit of discussion on the troll narrative in general is warranted. The most common analogy is to the Norwegian fairy tale known as Three Billy Goats Gruff, wherein three sibling goats are accosted by a troll as they attempt to cross a bridge to reach a field for grazing. (A quintessentially ‘patent-lawyer’ manner of describing this tale, if I do say so myself.) The reader is meant to identify with the goats, rather than the troll, because eating constitutes a basic need, and the troll represents an obstacle to fulfilling that need. Left unknown, however, is the ownership status of the field the goats have already over-consumed (tragedy of the commons, perhaps? ), the field on the other wide of the bridge that the goats wish to consume, riparian rights to the stream, and the bridge itself. None of this should matter, we’re left to assume, because the reader is to recognize the troll as a wrongdoer. The moral of this tale absolute requires the belief that the troll lacks any valid claim to prevent our three protagonists from completing their journey. This proves more than the fact that a lawyer can ruin even a simple fairy tale, however. Just as with the fairy tale, followers of the patent troll narrative must, for the meme to take hold, believe the fabled troll lacks any valid claim to the subject of the patent assertion. In this manner, patents are described in terms of subsidies, favors, monopolies and other similarly economically-‘evil’ grants handed out by the government to a select few at the expense of the populous. This misguided viewpoint is the key to making the troll narrative work. 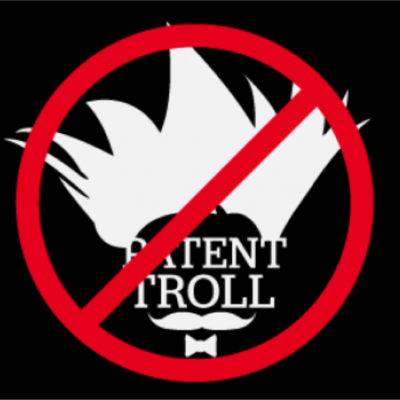 Indeed, the patent troll myth disintegrates upon viewing patents as property rights. Imagine one day a fleet of construction trucks show up on your front lawn and begin construction of an office building directly outside your front door. You visit your lawyer to file a lawsuit with the expectation of getting a court order prohibiting this clear violation of your property rights. The construction company responds to your lawsuit by telling you: “1) we aren’t actually on your property because we believe your property rights stop right outside the door and don’t extend to your front lawn; and 2) you don’t actually own any of this property because we can spend hundreds of thousands of dollars to dredge up witnesses to say they actually bought your house instead of you.” Outraged, you proceed to court and emerge victorious because they are clearly on your property and you are clearly the owner of it. On the basis of this classic moral justification for all property rights — that people should have the fruits of their productive labors secured to them as their property — early American legislators and judges secured stable and effective property rights to innovators and creators. This was part-and-parcel of American exceptionalism. The U.S. was the first country to protect true property rights in inventions and creative works. Unlike proponents of the patent troll narrative, these statements go beyond rhetoric and puffery, instead relying on Professor Mossoff’s “decade-plus research on the natural rights justification for patents and other IP rights (see here, here, here, here, and here), and on how this theory was applied in the uniquely American approach to securing patents as property rights (see here, here, and here).” In addition, Professor Merges has, quite literally, written a book on the philosophical principles underlying intellectual property and concluded that the entire paradigm lies on a foundation of property rights supported by Locke’s appropriation theory (among others). The first step, therefore, in reclaiming the narrative of individual achievement, invention and innovation for patent owners is to study this scholarship and convince the world, once and for all, that patents are, in fact, property.